It's more like that they are aiming for full replacement of 64, but since the next cabinet decides they can decide to go for 7 bn instead of 10. Operating cost of the package can't exceed 10% of defence budget, which is close to what the current F-18 setup costs. 2018 budget is around 2.9 Bn, so 10% for 300 million euros per year should be close enough estimate. That's for "64" F-35, ammo and other kit. SpudmanWP wrote: F-35s have better range & can do more than their classic Hornets so my calculation is that it will be cheaper, per mission, to operate the F-35. Better range and can do more? Indeed but nevertheless they still want 64! Regarding the costs: Did you miss my comment about "military inflation"? It hits everybody including the F-35. Denmark has a slightly bigger economy than Finland (and a much more robust economy!) and still they will be struggling to operate a much smaller number of F-35 that what Finland is is hoping to operate. This is not just because of reduction in military budgets you know. Finland has made it clear they want 64 a/c. I predict they need to go to a lower number to be able to afford the operating costs if they want the F-35. The only other alternative would be to shift money from e.g. the army or navy. I doubt that will happen. It is also interesting to note (as stated above) that the Danes concluded that per plane the F-35 had higher operating costs than the SH, even if the F-35 is cheaper to upgrade, etc. My guess: Finland will go for F-35 in the end but they will have to accept a lower number. They can probably afford to buy 64 F-35 but they will not be able to afford to operate them in any meaningful manner given their fiscal constraints. I think they can do it on 300 million a year for basic costs, with a lot left over. Guess it depends on how many hours they are going to try and fly per year, then again the F-35 has it's advance sims which should help cut down on training flight hours per year. Plus the USAF is somewhere in the $30,000 range per hour atm, I would assume by the time 2023-2024 roles around and the fleet is over 1000 aircraft that cost per flight hour for the USAF will be in the mid $20,000 range, so my numbers are prob high. But not knowing what special requirements the FiAF might demand there cost's could stay higher than USAF. If the current CPFH is 12k and if it doesn't include completely different numbers than the US, then you can be sure it can't be doubled and stlll survive with the same amount of units and share of the total budget. There isn't that much slack in the current setup. I guess the old F-18 cost can't be that much lower than F-35A eventually, so it must be that the 30k CPFHs just include much more items than Finnish 12k/h. Last edited by magitsu on 30 Apr 2018, 19:31, edited 5 times in total. Another thing I have mentioned several times but not seen a response to, is that it seems Finland wants to be operate their F-35 in a more independent manner than what others are asking for. Could this further inflate the operating costs for Finland? loke wrote: Another thing I have mentioned several times but not seen a response to, is that it seems Finland wants to be operate their F-35 in a more independent manner than what others are asking for. Could this further inflate the operating costs for Finland? Well, the question that you're referring to the one below, right? loke wrote: Regarding item 1: How would this affect the F-35? I may be wrong but I thought one of the ideas behind costs savings with the F-35 was that a lot of the maintainance and upgrade work will happen centralized? Well, I could be wrong but I guess that you're probably confusing the ALIS functionalities with actual maintenance work. While ALIS is a centralized system in order to help maintenance, this doesn't mean that the actual maintenance work or most of this work to be more precise has to be made in a "centralized depot". I would say that most of the maintenance work can and will be done in country (Finland in this case) and this applies to other countries that will operate the F-35 as well. Actually ALIS should make in-country maintenance much easier while at the same time lowering the cost of extra parts. Moreover and since most of the F-35's upgrades will be done solely or based on Software (as opposed to Hardware), this makes in-country upgrades much easier (and cheaper) compared to any other fighter aircraft. Of course there will always be extensive "maintenance work" that will likely have to be done abroad such as a potential Mid Life Upgrades (MLU) among other extensive work but this will also and certainly affect any other of the competing fighter aircraft. 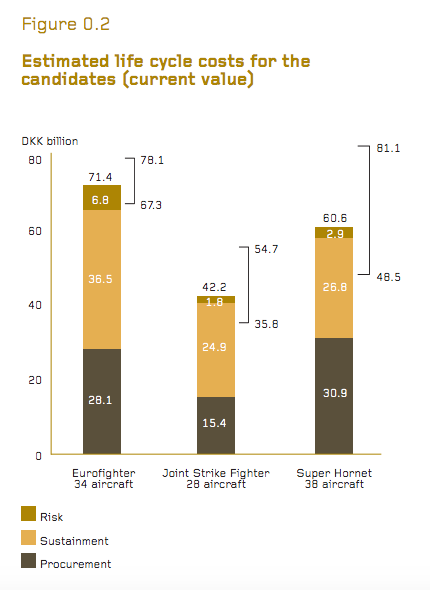 loke wrote: It is also interesting to note (as stated above) that the Danes concluded that per plane the F-35 had higher operating costs than the SH, even if the F-35 is cheaper to upgrade, etc. Keep in mind that the Danes also stated that more F-18s were required (38 F-18s vs 28 F-35s) in order to fly fewer hours per year with the goal to lasting as long as the F-35 (8k hrs). To my knowledge the US, UK and Oz and perhaps some other Northern Europeans have stated the FMS Full Mission Simulator will account for 50% of F-35 pilot training - not only initial but mission training (with perhaps more mission training as the FMS (becomes networked)/aircraft become more capable Block 4 onwards and upwardswise). ricnunes wrote: Well, I could be wrong but I guess that you're probably confusing the ALIS functionalities with actual maintenance work. While ALIS is a centralized system in order to help maintenance, this doesn't mean that the actual maintenance work or most of this work to be more precise has to be made in a "centralized depot". Also, perhaps you are confusing MLU with other activities. For the plan to achieve its savings goals, all of the partner nations must sign on to the F-35 program's regional approach to aircraft maintenance. But that may be tough to swallow for some participating nations, for military and also economic reasons. Countries want to hire as many homegrown workers as possible, and they also want to make sure they have enough spare parts and technology data to fly their aircraft independently. Lockheed Martin says it is working through these issues, in partnership with the Pentagon program office. So far, the need to keep costs down has helped to offset pressure to build extensive facilities in each participating nation, Gavaletz said. "They all want to do everything in every country, but they're also realistic that that's not going to be the case," Gavaletz said. "My biggest concern is people will put too much in and we'll have too much capacity." The military strategy of participating nations could be the biggest factor in how well this plan succeeds, Aboulafia said. He said the first eight participating nations are likely to support the maintenance plan to keep costs down. But countries that join later may be more reluctant, especially if they can tap into big defense budgets. "There are peacetime customers that want a turn-key solution, like Norway. Then there's the exact opposite, which is a customer like, say, Israel. They want a big in-country logistical presence of their own," Aboulafia said. I think one question is -- how much independence does Finland need? That article in case you notice is from 2007 and we're now in 2018 or slightly more than a decade and as such many things have changed since then. But and for what's worth I've been aware of the information that is on that article that you posted and that same "information" is IMO the result of a wrong perception and confusion by "analysts" between what is ALIS and what is actual "in-field" maintenance. What that article that you posted is trying to refer to (IMO) is ALIS which again the author/authors seem to be confusing with actual maintenance. And again I believe that many analysts confuse with centralized nature of ALIS - a system which helps maintenance - with maintenance itself. Again ALIS is not the maintenance, ALIS is a tool to help maintenance. I believe it's unrealistic to think that the majority of maintenance operations won't happen in country and will/must have to happen in foreign countries such as USA or Italy. For example, recently the US Navy demonstrated that it could perform F-35 maintenance operations onboard carriers (with the help of ALIS) so why on Earth couldn't Finland do the same with their F-35s in country, this if they choose the F-35? Finally and recurring in the risk of repeating myself, the majority of F-35 upgrades will be done (solely) via Software which makes these kind of upgrades much easier to perform in-country as opposed to abroad. the majority of F-35 upgrades will be done (solely) via Software which makes these kind of upgrades much easier to perform in-country as opposed to abroad. On that note, the first C2D2 drop is scheduled for next month (June 2018). Does anyone envision trouble from the fact that Finland requests a prime contractor instead of just buying planes? The contractor has to combine the best package, integrate it and deliver it working. I looked into the 10% upkeep costs. It's actually closer to 150 million, so 10% is bs and 5-10% of total defense budjet would be a closer assessment. The whole FiAF ran in 2015 with 180 million euros. Obviously not all of it was used on Hornets. So it's seems like only 150 million+ can be planned for the yearly cost of the new fighters. 8900*n=150,000,000... n would be 17k€/h. It should work nevertheless. About the capability assessment of the Finnish project. "If a candidate can provide the required supply and training system with less resources than others, it can allocate resources to increasing the military capability or lowering the upkeep costs. For the former this may enable extra investment into the amount or quality of armament, sensors and EW systems. For the latter, provider can for example increase the amount of spare equipment and supplies in their package." ...Finland is in the early process of buying a new fighter. How do you balance between quantity and quality when looking at the new fighter? We have money for €7-10 billion (U.S. $8-12 billion), and we are going to buy 64 fighter planes. We have been always counting on quality: quality on planes and quality on training our pilots. Our pilots are the best in the world, let me say that, because they are trained so well. We have our own special program. We train them in Finland, and they get along very well in international [exercises]. I am thrilled to see what happens in the Red Flag exercise, what is the level of expertise of Finnish pilots now, because it has been very good during the recent years...."